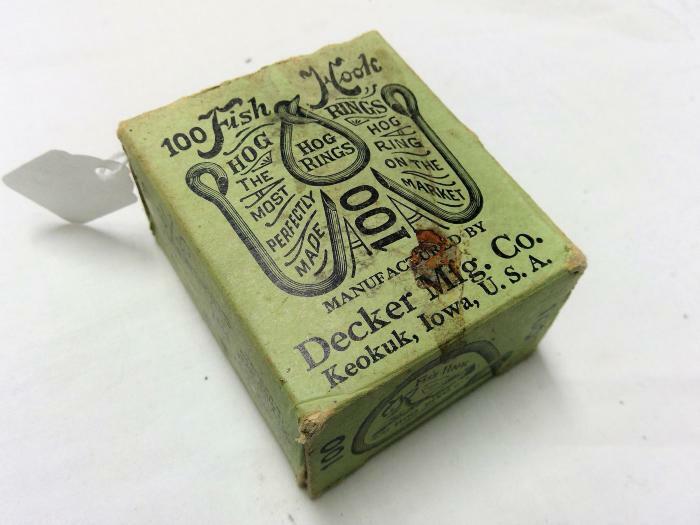 At the Plymouth Historical Society, we have a box of fish hook hog rings made by Decker Manufacturing Company. This company was established in 1878 and is still around today. Originally the company worked predominately with barbed wire, but has since developed many different agricultural products. It is difficult to tell how old the box is, but it is clear the rings must have had some practical purpose on the farm. In fact, nearly the same exact product is still on the market today. When learning that some hogs have rings placed in their noses, the initial reaction might be that it is a cruel practice. It does cause some pain and inhibits the swine’s natural behavior. If it has negative side effects, why would even the most animal conscious hog producers still consider using them? The answer lies in what that natural behavior is. Hogs have a tendency to do something known as rooting. It sounds exactly like what it is. The hogs use their noses to dig into the dirt to find roots to eat along with worms. They also may be looking for cooler dirt to lie in on a hot, summer day. For a farmer who places their pigs in a pasture, this can cause significant problems. The first is that the pigs may root under the fence and be able to escape the pen. Second, the process of rooting will destroy the sod and significantly reduce the productivity of the pasture. For pigs that are raised on concrete, they too will try to root and this can potentially lead to injury. For these reasons, some hog producers choose to place hog rings in their animal’s nose. When the hog tries to root, the ring becomes painful and the hog will stop rooting. This, in turn, protects the farmer’s pasture and prevents hogs from escaping their pens. These nose rings are just one of the many different objects at the Plymouth Historical Society that relate to the hog growers of Plymouth’s past.